From the overlook in front of the falls, you notice that Mad River Falls consists of several horsetails falling into a yellow-tinted pool. Aside from admiring the 70-foot total drop of the falls, there is not much to do here. Exploring is extremely limited, as it is too dangerous to scramble closer to the falls. 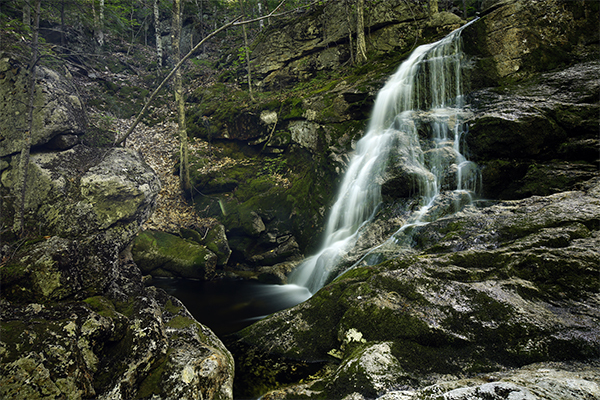 Photography is limited too, since the falls are partially hidden behind trees and leaves. The selling points of visiting these falls are that they are quite tall and that the hike to the falls is pleasant and never crowded. 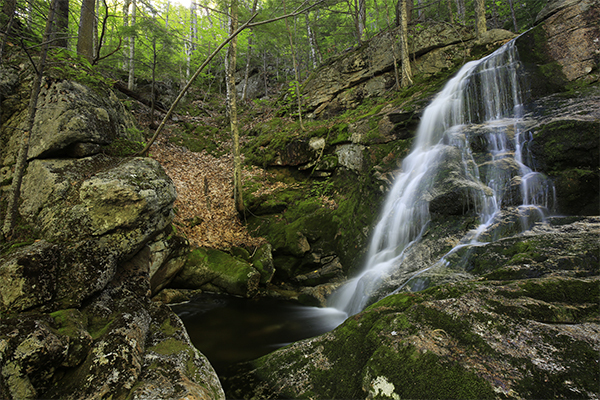 The trailhead for these falls also accesses the Bickford Slides, a series of three beautiful slides and several fine swimming holes within a designated wilderness area. 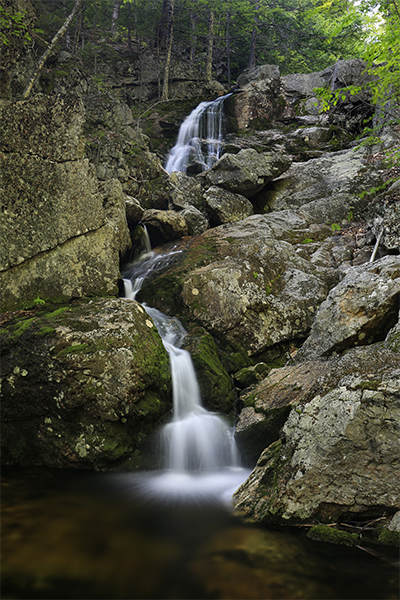 The trailhead for this waterfall is located across the street from Brickett Place. 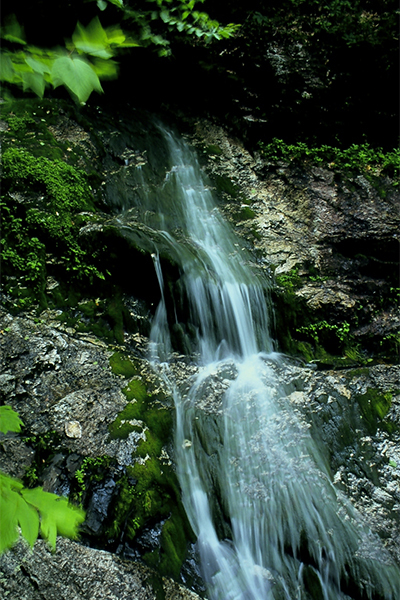 To reach the falls, you are going to follow the yellow-blazed Royce Trail generally north for 1.6 miles. After hiking this trail for 0.3 mile, you will reach a field clearing and the trail will suddenly fork right. The trail markers can be difficult to spot here, so pay close attention to the trail. From here, the rest of the 1.4 mile hike is normally fairly simple, but there are four water crossings of the Mad River that can be difficult in high water. During the warmer summer months, the Mad River is usually only ankle-deep and far from being mad in terms of rushing water. Trekking poles can be helpful in getting you across the river crossing. In early spring or during other times of abnormally high water, the river may be mid-leg deep or even higher. If you find the river to be higher than mid-leg, you may want to turn around and visit the falls another day. Soon after you cross the Mad River for the fourth time, the trail begins to climb steeply. After a moderately steep climb of 150 feet, you will reach a spur trail on the left about 1.6 miles into the hike. This spur is currently marked by a sign and an arrow for “Mad River Falls.” Take a left and hike 50 feet each to reach an elevated and partially-obscured view of falls. Scrambling to the base of the falls does provide superior views but it is extremely steep and not recommended. From the junction of ME 113 and US-302 in Fryeburg, Maine, take ME 113 north (which is also initially called River St) for 19.7 miles and take a right into Brickett Place, where a hiker’s parking lot can be found. If you are traveling on ME 113 south from US-2 in Gilead, Brickett Place will be on your left after driving 10.5 miles. Bricket Place is also 0.3 mile north of Basin Rd, a spur road that leads west to the trailhead for Hermit Falls, and 5.6 miles south of the short spur road that leads east to the trailhead for the Caribou Trail and Kees Falls. Take note that ME 113 is a gated seasonal road, with a typical opening date in mid-May and a closing date that ranges from early October to early November, depending upon the year. Access to this trailhead in the offseason is only possible from the south as ME 113 is gated for a 9.1 mile section of road from 0.2 mile south of Brickett Place up to 1.6 miles south of where ME 113 connects with US-2. To access the falls during the winter or shoulder seasons, park near the gate (but do not block it) and walk 0.2 mile north to Brickett Place. The official website of the White Mountain National Forest contains a page that indicates the current status (open / closed) of ME 113 and other national forest roads. To get to Fryeburg, take NH 113 east from NH 16 in Conway, New Hampshire into Maine. To get to Gilead, take US-2 west from Bethel or US-2 east from Gorham, New Hampshire. Please be aware that this trailhead is part the White Mountain National Forest parking fee program. The fee was $5 per day in 2017. To pay the fee, bring cash and fill out a form at the self-service kiosk at the trailhead. There is no fee if you own and display one of the annual passes issued by the federal government as part of the National Parks and Federal Recreational Lands Pass program. You can also purchase an annual parking pass to only the White Mountains by visiting one of the district offices of the national forest.